Determine which foods in your house are safe or unsafe for a person with a peanut allergy to eat. Decide how to manage safe and unsafe foods in your home. Have you read the food label section of the guide yet? No? Go read it. Now it’s time to put your newfound expertise in food label reading to use. Start with what is already in your fridge and your pantry. If you want to know which foods are safe, you’ll need to look at the labels on everything, and I do mean everything. No exceptions. If there are any foods in your house that you are unsure about because you lost or removed the ingredient label– oatmeal in a canister, for instance — I would recommend that you discard those to be on the safe side. Discard all the unsafe food (a food pantry would likely be happy to take unopened food packages; neighbors or extended family may want the rest). Declare your home peanut-free, and avoid bringing any food that contains peanuts or has a significant risk of containing peanuts (foods that are labeled as MAY CONTAIN PEANUTS, for example) into your house. 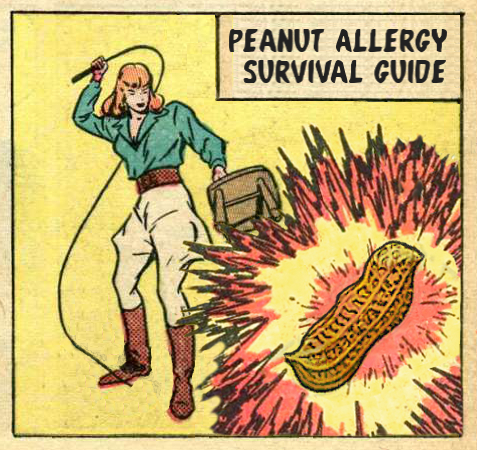 In a peanut-aware home, some foods containing peanuts or foods that may contain peanuts are kept in the house for people in the household who are not allergic to peanuts and/or guests who are not allergic to peanuts to eat, but these foods are strictly segregated from any food that will be eaten by the peanut-allergic person, and all members of the household work together to help make sure that the peanut-allergic person will not accidentally eat unsafe food. If you decide to go this route, to be safe, you will need to take strict precautions to keep that food that contains or may contain peanuts completely separate from peanut-safe food. To avoid confusion, especially if there are small children (or adults who are easily confused) in the house, you may want to make or purchase special brightly colored allergy labels to help distinguish safe and unsafe foods. It’s also important to make sure that you clean all dishes and kitchen and dining surfaces very thoroughly after any food containing peanuts, peanut butter or peanut oil is served. Even trace amounts of peanut residue– less than 1/100th of one peanut– can cause an allergic reaction. A peanut-free home can feel like a relaxing safe haven for a person who has to worry constantly about and check up on food everywhere else, especially if that person is a child. You won’t have to worry about separating foods or labeling them clearly with stickers to avoid mix-ups. You won’t have to worry about cleaning up every accidental smear of peanut butter or cookie crumb on your counter before preparing the allergic person’s meals. The peanut-allergic person will be able to share meals with other family members without excess worry and without feeling excluded. The peanut-allergic person will not have to constantly check and recheck which foods in the house are peanut-free. The risk of the allergic person accidentally ingesting peanuts at home will be greatly reduced. If another person in the family already has other, different dietary restrictions, it may be difficult to balance both family members’ needs. Special allergy-friendly foods can be expensive, and it costs more to buy them for a whole family than it does to buy them for just one person. Even when a family goes to great lengths to keep a home peanut-free, there is always some possibility that peanuts will find their way into the house anyway. Guests, even close friends and family members, do not always listen to instructions not to bring food containing nuts when they come to visit (ask me how I know). Food labels, as mentioned, can be very confusing, and manufacturers sometimes change food ingredients or allergen separation procedures without warning, so it is pretty much impossible to make sure that all of the food you eat is totally free from any risk of peanut cross-contamination unless you grow, package and cook all of it yourself. For the record, I do keep a peanut-free house. And I definitely personally feel that my young son is safer and happier in a home where he doesn’t have to constantly remember to ask me whether it’s all right to eat that cookie.